By now I had already extended my stay here in Otavalo by several additional days. There is so much to do, so many kind people, and the hostal is very peaceful. But somehow today I knew that I was ready to be moving on. Maybe it was the train I couldn’t ride. Rejection is usually the time to end relations. Before I arrived in Otavalo I planned to visit the famous weavings market in addition to attending Inti-Raymi festivities. 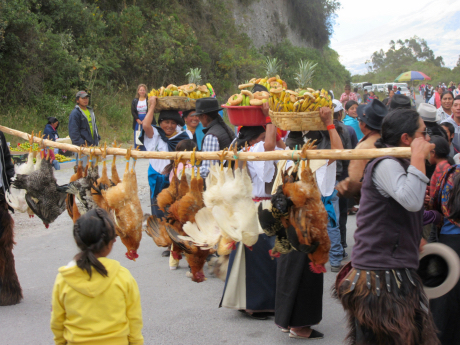 The Saturday morning animal sales across the Pan American Highway was also a strong attraction. Then too, there’s the train that runs from Otavalo to the coast, stopping at a small town called Salinas. This is not the popular beach town of Salinas, near Guayaquil, but an Afro-Ecuadorian village up near the Colombian border. Sadly, the train is overbooked and over sold, so I’m not going to stick around another week in hopes the seating fiasco will sort itself out. One traveling idea I’ve had is/was to head to the northwest coast near Esmeralda and then work my way down to Guayaquil. But after some conversations last week, I discovered that a trip to the Amazonian jungle, like a cruise in the Galapagos, is not an unreasonable possibility. Bam! This changes everything. My priorities just changed and rearranged. No more, the notion of a slow trail down the coast. I’m off to Guayaquil now instead of visiting at some vague time at a later date. In a bit over 2 weeks I’m scheduled for a 12-day retreat south of Cuenca, so Guayaquil just got moved up the list to number one. After the retreat I will head to Lago Agrio for a trip to the Amazon, and pretty much duplicate the strategy that I have already planned for the Galapagos in September: hurry-up and wait. The standard routes to these 2 destinations is through one of countless travel agencies, which is in so many ways a smart move. There are branches of these agencies in not just the major cities, but also in the Galapagos and the gateway cities to the Amazon: Lago Agrio and Napo, though choices at the last 2 locations are severely limited in these tiny, oil industry settlements. Trying to plan one of these trips independently without an agency can well be a nightmare. Both the islands and the jungle encompass vast areas and the success (or not) of either visit is driven by a complex coordination of elements, not the least of which are time and timing. If you don’t have one you will never have the other. Both destinations are also highly restricted biospheres and wandering on one’s own is strictly prohibited. The best of the travel agencies (do your research before you get here) will not only devise a trip for you but they will listen to you as well. If you want to SCUBA dive with sharks, but are turned off by iguanas, they want to know this. If you want to see pink river dolphins but are not that interested in visiting indigenous jungle villages, they want to know this too. By thoroughly interviewing their clients these highly professional agencies can create tours that will provide tourists with a genuine trip of a lifetime and the trip will be based on the desires of the traveler. Both the Galapagos and the Amazonian Basin are unlike any other places in the world. And an experienced and committed travel agency will ensure you receive memories never forgotten. But it won’t be cheap. Like anything of quality and singularity, you really do get what you pay for and these 2 destinations don’t come for free. Yet one can greatly reduce the costs if time is on your side. A two-week break from the normalcy of life won’t make it though. For that, just accept the breathtaking costs and know that you will have purchased opportunities unavailable elsewhere and worth every bit of the expense you incurred. But if you do find that you have more time than money, fly to the Galapagos, or arrange for time in one of the Amazon gateways. People are changeable creatures and if you have the patience to wait for change, visiting either of these destinations need not cost so dearly. The travel agencies who book these tours must frequently face cancellations and subsequently must deal with them as quickly as possible. Because all of the Galapagos are part of a national park, the schedule of tour vessels is very tightly controlled. These schedules are assigned once yearly and each separate vessel, whether a small sailing yacht or a 100-passenger cruise liner, must adhere to this pre-set timeline or risk losing their license for that year. So if they have cancellations they must fill them quickly or possibly lose money for that particular cruise. A full passenger manifest is more important at this point than maximum profit. Because of the strict governmental rationing, having fewer visitors than allowed for a particular vessel can mean a reduced quota for the following year. At this point head-count trumps all. This being the case, if a potential passenger (with more time than money) is there on the dock when such an opening occurs, then the chance for a discounted passage opens, however briefly, and very often at a discount approaching 50% or more. Though not as dramatic, a similar opportunity can and does happen with the jungle excursions. My physics professor friend from New Zealand happened to be at the right place at the right time, so she took a 2nd Amazon trip for 1/3 the cost of her first one. While it didn’t provide her with the luxury of the first one, she saw a different area of the Basin in a non-motorized canoe and without the outboard motor noise she saw far more animals than during the first, expensive high-end trip. Thus, my night bus to Guayaquil. It leaves at 9PM, in about 5hrs time, taking close to 12hrs to make it there. I’ll arrive in city-center about rush-hour, looking for breakfast and booked into a hotel in the historic district. My bags are packed and I’m taking a last stroll through Otavalo. This is a place I’d love to return to. There are so many great experiences that I’ve had here and the “Valley of the Sunrise” has so many more. 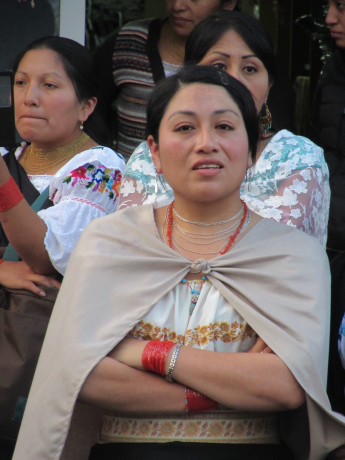 This entry was posted in Indigenous, Otavalo and tagged Ecuador, Guayaquil, indigenous, Inti-Raymi, Kichwa, Kitchwa, Otavalo, Quechua, Spanish language on 2015-06-28 by kmalivuk. Sounds exciting and I look forward to reading all about this new experience. On a very different note I just read that there is a new Guinness record. Ecuadorians planted 647,250 trees on May 17th. Almost 45,000 people joined to plant 216 species of trees over nearly 5000 acres in 150 locations in Ecuador. According to the online pictures, the volunteers who showed up to aid reforestation ranged in age from small children to very senior adults. The stated goal is to repeat this until tens of thousands of acres have been planted. Marilyn, Ecuador is nothing if not a contradiction, even to its own self! On the one hand there are those moves that you mentioned along with a recent multi-billion dollar win against Chevron for evil past deeds. And then on the other you see the government selling the indigenous up the river as it were, with the world’s largest open pit (gold) mine, plus a gov’t mandate to convert all private residences to all-electric appliances to satisfy a Chinese multi-billion debt mandate. But hey! Tomorrow I’m out of Guayaquil and on to Zaruma, a captivating colonial mining town off the tourist trail and short-listed for a World Heritage Site. Many of the streets there are connected to each other by stairs since it’s built on the side of a steep mountain, and the houses are all made out of wood, a rarity here in these parts of the world. Life’s interesting; send my love to the yoga class.